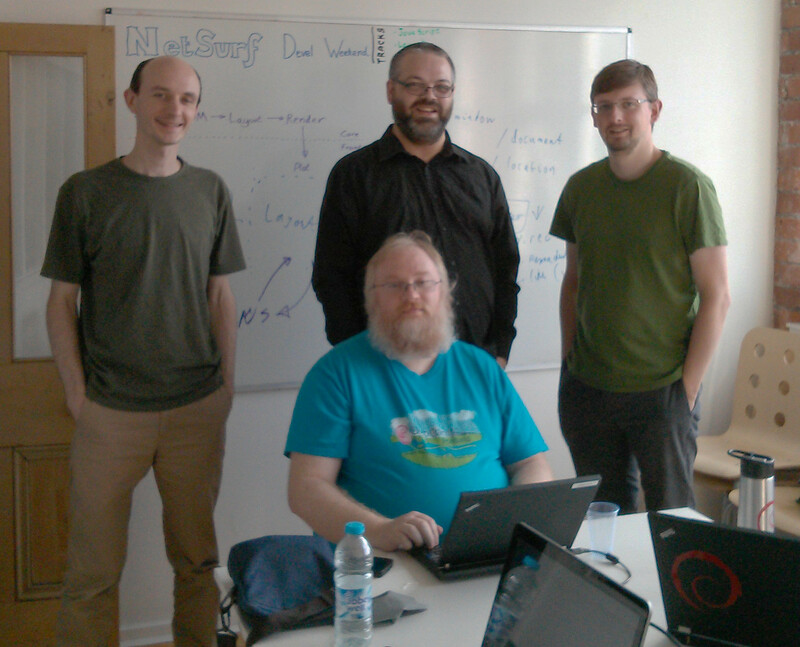 Once more the NetSurf developers gathered to battle the forces of darkness, or as they are more commonly known web specifications. The fifth developer weekend was an opportunity for us to gather in a pleasant setting and work together in person. We were graciously hosted, once again, by Codethink in their Manchester offices. Four developers managed to attend in person from around the UK: Michael Drake, John-Mark Bell, Daniel Silverstone and Vincent Sanders. Although the browser obviously already has both these features they are somewhat incomplete and incapable of supporting the features of the modern web. The main reasons for the change are that Spidermonkey is a poor fit to NetSurf as it is relatively large and does not provide a stable API guarantee. The lack of a stable API requires extensive engineering to update to new releases. Additionally support for compiling on minority platforms is very challenging meaning that most platforms are stuck using version 1.7 or 1.85 (current release is version 31 with 38 due). We started the move to Duktape by creating a development branch, integrating the Duktape library and open coding a minimal implementation of the core classes as a proof of concept. This work was mostly undertaken by Daniel with input from myself and John-Mark. This resulted in a build that was substantially smaller than using Spidermonkey with all the existing functionality our tests cover. The layout library design discussion was an extensive and very involved. The layout engine is a browsers most important component. It takes all the information processed by the CSS and DOM libraries, applies a vast number of involved rules and produces a list of operations that can be rendered. This reimplementation of our rendering engine has been in planning for many years. The existing engine stems from the browsers earliest days more than a decade ago and has many shortcomings in architecture and implementation we hope to address. The work has finally started on libnslayout with Michael taking the lead and defining the initial API and starting the laborious work of building the test harness, a feature the previous implementation lacked! For a war you need people and it is a little unfortunate that this was our lowest ever turnout for the event. This is true of the project overall with declining numbers of commits and interest outside our core group. If anyone is interested we are always happy to have new contributors and there are opportunities to contribute in many areas from image assets, through translations, to C programming. We discussed some ways to encourage new developers and try and get committed developers especially for the minority platform frontends. The RISC OS frontend for example has needed a maintainer since the previous one stepped down. There was some initial response from its community, culminating in a total of two patches, when we announced the port was under threat of not being releasable in future. Unfortunately nothing further came from this and it appears our oldest frontend may soon become part of our history. We also covered some issues from the bug tracker mostly to see if there were any patterns that we needed to address before the forthcoming 3.4 release. There was discussion about recent improvements to the CI system which generate distribution packages from the development branch and how this could be extended to benefit more users. This also included authorisation to acquire storage and other miscellaneous items necessary to keep the project infrastructure running. We managed over 20 hours of work in the two days and addressed our current major shortcomings. Now it just requires a great deal of programming to complete the projects started here. Now about 1000 of company provide Forex signals. Lot of company spam ,some company just update website not provide signals and there cheat members money, but I said that Usa Forex Signal provide 100% real Whatsapp, Skype and Email via forex signals company. Usa Forex Signal 100% challenging Forex signals compay in the world wide.100% satisfaction Forex signals provider company Usa Forex signal provide right Entry and Exit price. And monthly Specials signals provide. Usa Forex Signal provide better timing to penetrate and get out trade not need to spend much time waiting before the screen. . Usa Forex Signal provide consider entrepreneurship as traders full-time and part-time can make reference to commercial success. 100% challenging forex signals provider is Usa Forex Signal . World Best Forex Signals And Trade Copier Service Provider is #HotForexSignal. Foreign exchange marketplace, fx and forex market all check with the buying and selling that takes place within the global marketplace, trading of currencies between countries, and is thought and known as forex trading. Before getting into the forex market it is recommended to first do some research to your own so that you can apprehend the chance and blessings of the change.